The environment in which we use our eyes now is different than it was 10 years ago. New indoor lighting types and a drastic increase in use of digital devices has caused a dramatic increase in blue light exposure. Current research shows that blue light causes retinal cell death. It is essential for us as eye care experts to understand blue light and how we can manage it in the clinical setting. Fortunately lens technology is evolving so we can deal with this change to our visual environment and better protect our patients. Technological advancement is all around us. These advances aim to make life more convenient - and whether you love them or hate them, they are here to stay. The music industry has gone from records to 8-tracks to cassette tapes to compact discs and now to digital files. What about when we travel, Uber and Lyft have changed the way we get a ride. Because of these changing technologies, the customer’s demands change, and industries must in turn evolve and adapt, creating new up-to-date solutions to meet and exceed their customer’s needs – or risk being left behind. What about lenses? Have they evolved? Certainly, over the last 50 years we have gone from bifocals to progressives, glass to polycarbonate to high index, thick to ultra-thin lenses and most recently from front side only UV protection to front and back side UV protection. All these changes are worthwhile, however our patients continue to change the way they use their eyes, while the environment in which they use their eyes is also rapidly changing. It is essential as eye care providers we employ technology that evolves with our patients. These changes are all around us, but they are so common place that many times we do not recognize the impact they have on vision. One major change is blue light. Blue light is not new – it is part of the visible spectra [Figure 1]. The sun has been the single biggest source of blue light since the beginning of time with an exposure outdoors 500 times greater than indoors. The change in blue light comes with our knowledge of its effect on the visual system. Thanks to the research done by the Paris Vision Institute and Essilor, we now know that most swine retinal cell death occurs when these cells are exposed to the blue-violet light bands between 415nm-455nm, with a peak at 435nm  [Figure 2]. Fig. 2: Toxic action spectrum of light on apoptosis for A2E-loaded RPE cells (40 µM A2E). ***p<0.001 as compared to control cells maintained in darkness. This is considered damaging harmful blue light and has no benefit to the visual system. Blue-violet light has always caused damage to the visual system – but this is not the change we are referring to……. the change that is at the forefront of our profession is our patient’s level of exposure to this blue light. revolution is also changing our visual environment. We are a “plugged-in” society, 30% of adults spend 9 or more hours daily on a digital device, 1 in 4 children spend 3 plus hours a day on a digital device and many adults check their phones close to 100 times per day. The technology revolution is causing increased blue light exposure because the vast majority of these devices that we are now attached to, use LED light sources. Since the damaging effects of blue light are cumulative , it is important that we take into account our exposure from all sources and craft solutions to address exposure from those sources. There is no doubt our visual environment is evolving - the way in which we use our eyes is different now than it was 10-15 years ago. The amount of blue light we are exposed to is rapidly increasing. From our new more energy-efficient light sources to the exponential availability of digital devices, to the sunlight, blue light is everywhere. To protect our patient’s visual system our lenses must evolve. We are currently at the beginning of a new lens technology evolution. Over the past few years the major lens companies came to market with new technologies protecting against blue light. Whenever a profession is in the early stages of technology evolution, it is essential that experts in the field truly understand the new knowledge and products. In the optical field we are no different. As the optical experts, our customers and patients rely on us for our knowledge. In 2015, the Vision Council reported that 72% of adults were unaware of the dangers of harmful blue light. That means in my clinic almost three-quarters of the people I see have no idea that damage is occurring daily nor are they aware where this damage is coming from. This damage is cumulative, making prevention critical for maintaining ocular health. What does current research tell us about blue light? It is very important to note that not all blue light damages the retina. 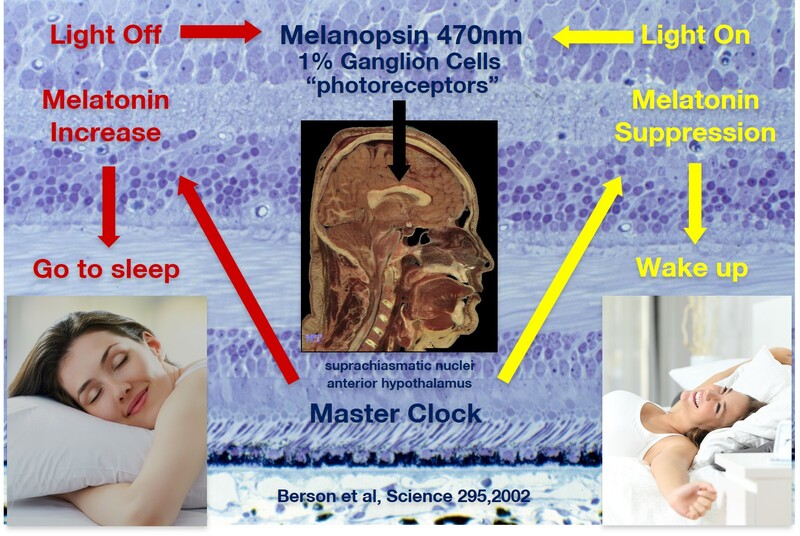 Blue-turquoise light from 465nm-495nm is in fact very beneficial to our sleep/wake cycles and hormone balance. Not all blue light is harmful so we must understand which wavelengths we need to block and which ones are good. These are the findings that I use in my clinic when discussing blue light and blue light reducing products with my patients. Since current research shows that blue light causes retinal cell death, specifically 415nm-455nm, blue-violet light has been linked to causing age-related macular degeneration. [12, 13] Many other factors determine a patient’s risk for this disease including age, race, genetics, diet, smoking status and weight. Blue light is a key ingredient in this mix because all other risk factors are difficult to modify in my patient population, but I can easily reduce the amount of blue light my patients are exposed to, thus reducing their risk factor for retinal disease. What optical solutions do we have to reduce blue light exposure? The first evolution involved lenses containing pigment to absorb blue light, mainly melanin. Melanin does a good job of absorbing a wide range of blue light, both harmful blue light and good blue light. Putting melanin in a lens causes it to have a yellow tint, which can be considered cosmetically unacceptable for some patients. The next technological wave was non-glare (i.e. anti-reflective) lenses, which deflect a percentage of blue light away from the lens. They are cosmetically more acceptable than melanin-containing lenses, but still look different to regular non-glare lenses because of the blue light that is deflected off the lens. Nearly 80% of patients accept this difference if it is explained to them properly. When comparing different products it is important to keep in mind the percentage of blue-violet light from 415nm-455nm that a lens blocks, not just the total amount of blue light. Moreover, if the lens blocks light above 465nm that is actually beneficial light and that does not lead to advanced retinal cell death. Some lenses on the market today have big claims regarding the amount of blue light they block, but it is not just the amount, but also the specific wavelength that is important. In 2013, Essilor launched Crizal® Prevencia® as the first selective clear lens on the market to provide protection from both UV radiation and harmful blue light. This was provided as a non-glare lens treatment that deflected part of the harmful blue-violet light while allowing patients’ eyes to receive beneficial blue-turquoise light. This technology works on the principle of deflection and helps to block up to 20% of harmful blue light. Thanks to the innovative research done by the Paris Vision Institute & Essilor’s R&D team, this was a great evolution in non-glare lenses, and so far over 3 million patients are wearing it worldwide. Fast forward 3 years and what has changed. In 2016, Essilor is poised to be the leader in blue light protection. Another evolution in technology was needed to make this happen. Crizal® Prevencia® is an impressive product, but like other non-glare blue light reducing lenses on the market, increased costs and the blue-violet hue off the front of the lens were barriers for some patients. Thanks to Essilor’s outstanding R&D team they once again raised the bar and created an evolution in lenses, Smart Blue Filter™. Smart Blue Filter™ is embedded protection in the lens. The molecules in Smart Blue Filter™ absorb 20% of harmful blue-violet light from 415nm-455nm while allowing beneficial blue-turquoise light to pass through the lens. It is clear in color and appearance. The Smart Blue Filter™ removes the previous barriers to blue blocking lenses. It is automatically integrated into digital Varilux® lenses, Transitions® lenses and Essilor’s new enhanced single vision lens Eyezen™+ when you order these products. With the evolution of lens technology we can begin to deal with blue light much more effectively. As an optometric physician I can now talk with my patients about blue light exposure and their family history of retinal disease along with their personal modifiable risk factors and prescribe a lens that is best for them. The exciting part now is the ability to mix and match products and customize different levels of protection to create the Eye Protect System™. The research shows that blue light causes retinal cell death and I believe that an essential level of protection is important for every patient. This would include a Smart Blue Filter™ product (Varilux® Digital, Eyezen™+, Transitions® Signature®VII) paired with a Crizal® non-glare lens, providing a 20% reduction of damaging blue-violet light and an E-SPF® of 25 [Figure 3]. If the patient has more risk factors, advanced protection may be needed. Using a Smart Blue Filter™ product and pairing it with Crizal® Prevencia® would provide a 30% reduction in harmful blue-violet light and an E-SPF® of 25 [Figure 2]. The ultimate level of protection would include Transitions® XTRActive® or Transitions® Vantage® paired with Crizal® Prevencia®. This combination will block at least 45% of harmful blue light and provide an E-SPF® of 25 [Figure 3]. I use this ultimate level of protection for my patients who have early signs of AMD or a strong family history along with other risk factors. At this point we have only addressed part of the problem, which is blue light coming from indoor light sources and digital devices. One thing is certain, our patients all spend time outside and we must consider outdoor blue light exposure because the sun emits a lot of blue light. When Transitions lenses “activate” outside they provide between 85%-88% protection against harmful blue light and if paired with a Crizal® Product an E-SPF® of 25 is achieved [Figure 4]. An even higher level of outdoor protection would involve prescribing Xperio UV which provides an amazing 92% reduction of harmful blue-violet light and provides an industry leading E-SPF® of 50 [Figure 4]. "We can not only protect everyone’s eyes by using lenses that have dramatically evolved over recent years, but also have the potential to prevent devastating sight threatening macular disease"
• Blue-violet light from 415-455 nm has been evidenced as a strong oxidative stress inducer and a defense inhibitor, thus one of the most harmful forms of light for the retina. • The potential risk linked to the increasing blue light exposure can be modified thanks to the latest ophthalmic lens technology such as the Smart Blue Filter™. • Patient education is critical to raise awareness about both the harmful effects of blue light and existing preventive solutions. • Blue light is composed of a harmful (blue-violet) and beneficial (blue-turquoise) radiations. It is essential that an ophthalmic lens blocks the former and lets through the latter. • When comparing different optical solutions for blue light filtering it is important to keep in mind that not only the amount of blue-violet light blocked is important but also the wavelength bands blocked. 01. Citek, K, et al. The eye and solar ultraviolet radiation: New understandings of the hazards, costs, and prevention of morbidity. Report of a Roundtable, Salt Lake City Utah. 2011 June. 02. Arnault E, Barrau C, Nanteau C, Gondouin P, Bigot K, Viénot F, et al. 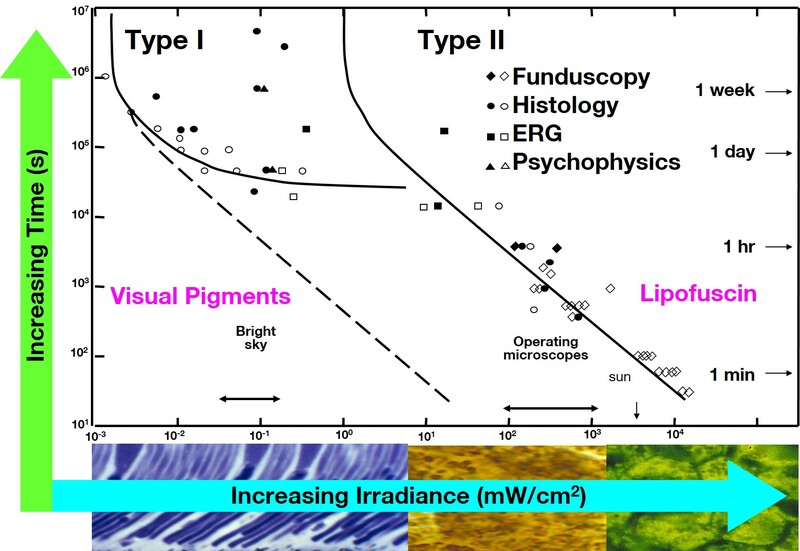 Phototoxic Action Spectrum on a Retinal Pigment Epithelium Model of Age-Related Macular Degeneration Exposed to Sunlight Normalized Conditions. PLoS ONE, 2013. 04. Blue Light Roundtable, NYC. A report on Blue Light Hazard: New Knowledge, New Approaches to Maintaining Ocular Health. March 16, 2013. 06. BARRAU C., KUDLA, A., TESSIERES M., Eye Protect System Lenses: From Research to Harmful Light Filtering, Points de Vue, International Review of Ophthalmic Optics, online publication, May 2016. 07. The Vision Council. 2015 Digital Eye Strain Report, Hindsight Is 20/20/20: Protect Your Eyes from Digital Devices. 08. Beatty S. et al, The Role of Oxidative Stress in the Pathogenesis of Age-Related Macular Degeneration, Surv Ophthalmol 45:115–134, 2000. 12. Godley BF, Shamsi FA, Liang F-Q, et al. Blue light induces mitochondrial DNA damage and free radical production in epithelial cells. J. Biol. Chem.2005;280(22):21061–21066.